Starring: The vocal talent of: John C. Reilly, Sarah Silverman, Jane Lynch and more. Finally, after a rather disappointing year for animated movies (and movies in general), here comes one of the BEST animated features of the year. 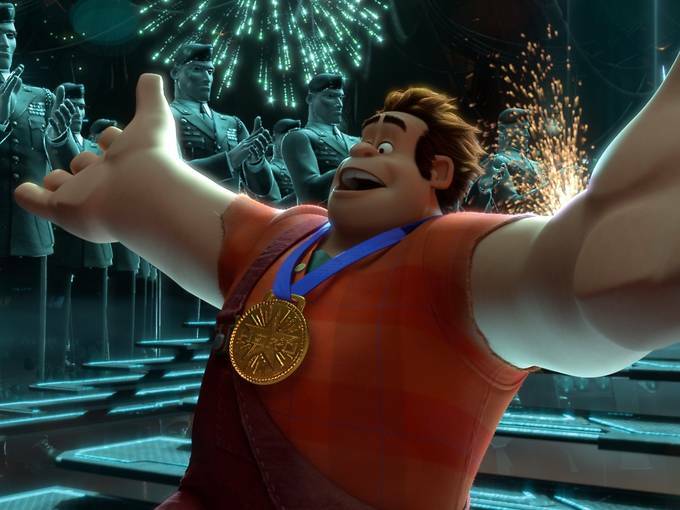 Wreck-It Ralph has something for everyone to enjoy. I find that several animated features are geared solely to young children and parents (if they go with their kids) are forced to sit through a rather uninteresting 90 minutes with a grin on their faces that is caused by their child’s laughter and not at all by anything on the screen. (Madagascar 3, Ice Age 4, and, yes, even The Lorax and Brave could be placed in this category for 2012.) 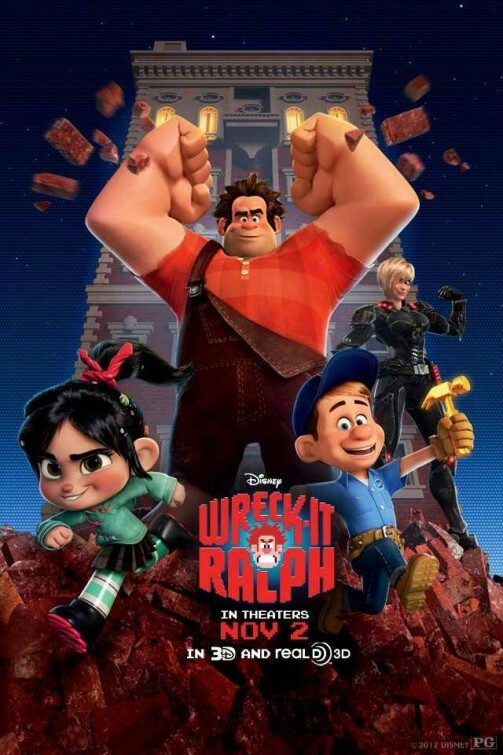 Wreck-It Ralph brings smiles to kids of all ages as the young kids will love what they always love about cartoons and the old kids (like this 30-year old blogger) will love it for the inclusion of so many iconic videogame characters from the past and their fusion into a singular and fun-filled story. Viewing it is quite like being a kid in a candy store as playing “Where’s Waldo” in looking for all of one’s favorite classic videogame characters is just as fun as watching the movie itself, without distracting from it either! A nice and refreshing movie with a new spin on the “videogame” movie genre. 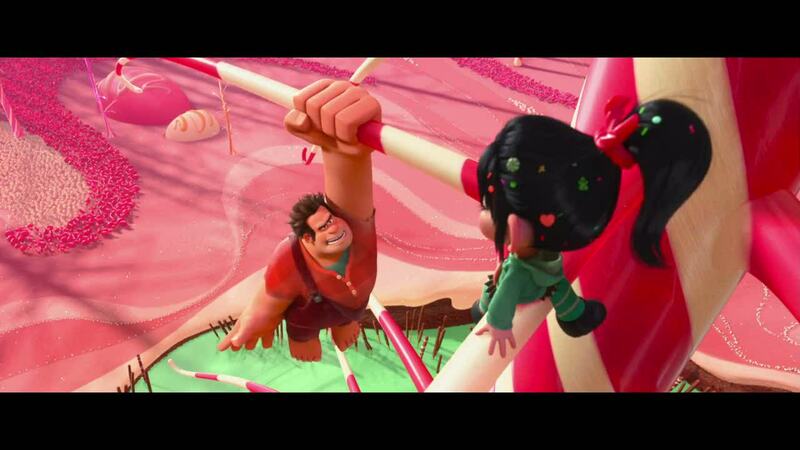 Wreck-It Ralph succeeds in giving audiences more to relate to as Ralph wants something more out of his routine, mundane, unrewarding life. The friends and relationships developed add to the story along with the fun references to several popular games of old and new popularity. Be on the lookout for relations to games such as Candyland, MarioKart, Qbert, Sonic the Hedgehog, Mortal Kombat, Halo, Mario, Call of Duty, Tanker, Pacman and more. A very impressive mix that spans decades of arcade game legend. There isn’t too much more to say about this movie really. It is fun, full of smiles and adventure, just the right amount of blend for everyone to enjoy. Take the entire family to watch it. Even if you’re not a gamer you will love it and I guarantee you will recognize at least one or two of the characters. It’s a fun and colorful Easter Egg hunt as Disney paints a wonderful picture of the world of arcade games that resembles a little bit of Toy Story. Sure, it has an expected ending, but it is the journey that makes it so much fun. The new characters end up just as enjoyable as the classic characters and in that way parallels the truth about gaming in and of itself. 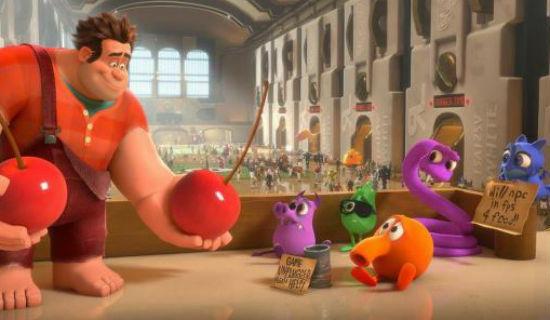 From the hardened soldier Calhoun, to the active little girl Vanellope, to several other characters, Wreck-It Ralph really brings them all together in a great world of arcade games as they hop back and forth in a “Monsters Inc” sort of way. 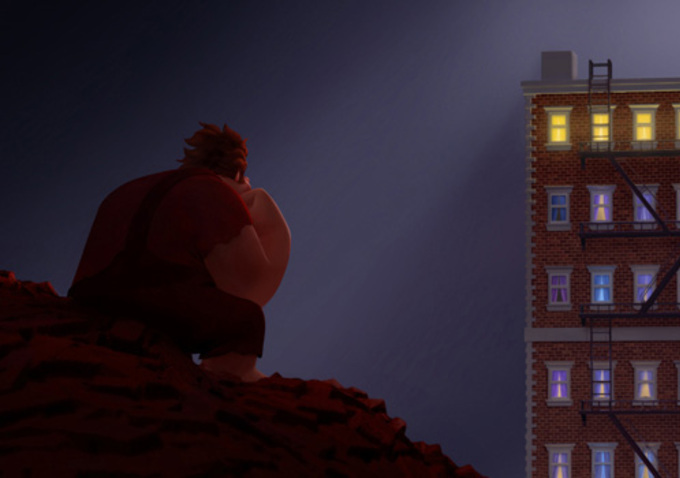 Yes, Wreck-It Ralph borrows heavily from other sources. And that’s okay. It takes what works form other beloved sources and puts them into one. The concepts from Monsters Inc, Toy Story, and beloved videogames. 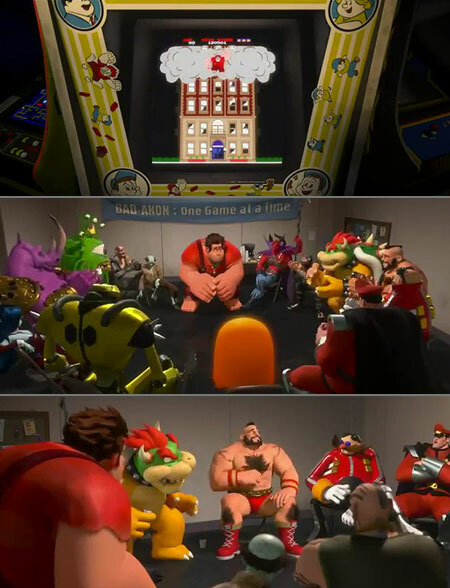 Wreck-It Ralph just works! ***Be sure you get to the theater on time! 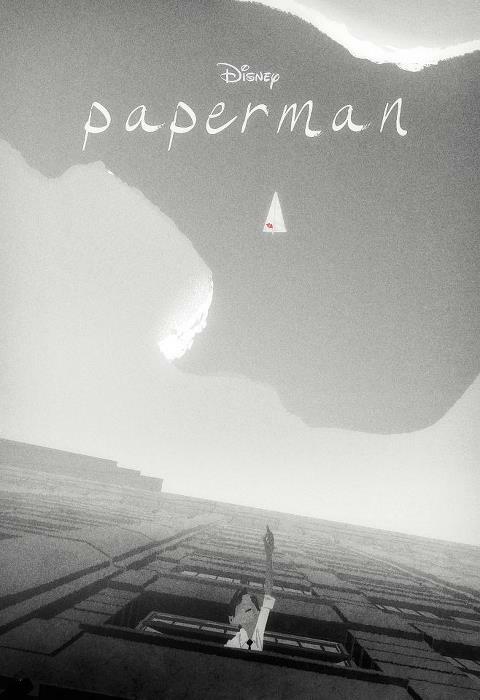 You do NOT want to miss the delightful treat of the animated short that precedes Wreck-It Ralph entitled Paperman. Trust me. It better be nominated for some awards come early next year, that’s all I’m saying! Don’t. Miss. It. Really glad to hear it was enjoyable. I’m sure it can now be called the best videogame movie ever made right? ha. pretty much. I really had a blast enjoying it. As a gamer, really looking forward to this, even more so now! Shame we have to wait until February for it though. Great review. Glad to see this gets your seal of approval, T. I’ve been looking forward to this since the trailers showed its potential. the potential was met for me and I thoroughly enjoyed it. and all the characters…so sweet. So I guess it like the Who framed Roger Rabbit of video games right. be sure you don’t miss being in that line my friend! Cool that you recommend this movie, I am looking forward to watching it ever since i saw the first trailer… too bad it comes to my country only in dec!! The animation was incredible and the assorted video game references for adults were fun to pick out. Once they get to Sugar Rush the story is definitely aimed at young children, but it was an enjoyable romp nonetheless. Thanks for taking the time to stop by and comment after seeing it. I was impressed by it and really haven’t been too impressed by animated features over this past year! This looks really fun T, though with Skyfall next week I don’t know if I’ll get to see this on the big screen, maybe a matinee showing down the road. I quite like the premise! it is a LOT of fun! I hope you get to watch it soon, it really is appealing to all ages.